The following is from Sam Kalda’s Of Cats and Men. These guys really really loved their cats. William Burroughs: In a gentleman’s club such as this, there are bound to be a few scandals. When Beat Generation writer William S. Burroughs’s novel Naked Lunch was published in 1962, it was the subject of what would be one of the last major obscenity trials for a work of literature in the United States. His gritty, drug-addled prose touched a nerve, revealing the paranoid shadow-self of booming postwar America. He was a revolutionary writer, gun enthusiast, junkie, and gay grandfather of the counterculture. However, amid the din of his much-discussed law-breaking exploits, there was a separate narrative playing out: the quiet story of Burroughs the cat man. 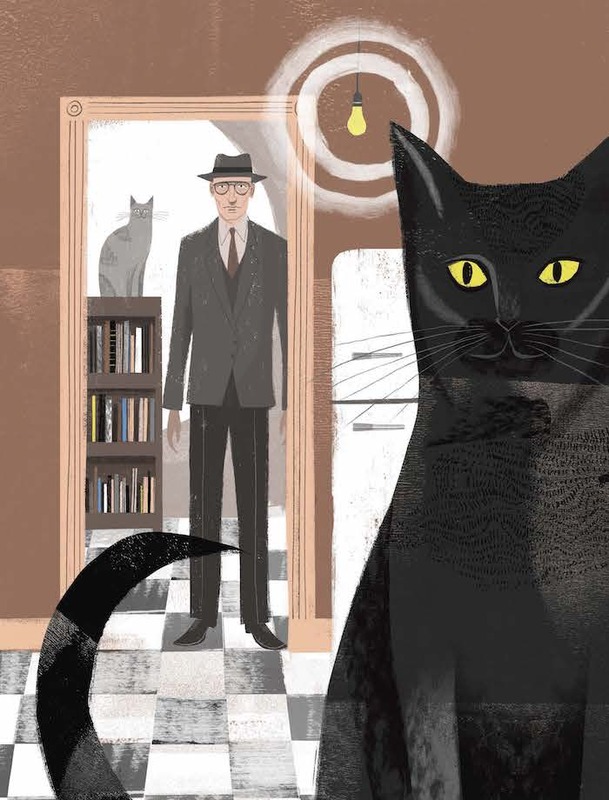 Near the end of his life, Burroughs wrote The Cat Inside, an autobiographical novella exploring his life through the cats he’d lived with over the years. 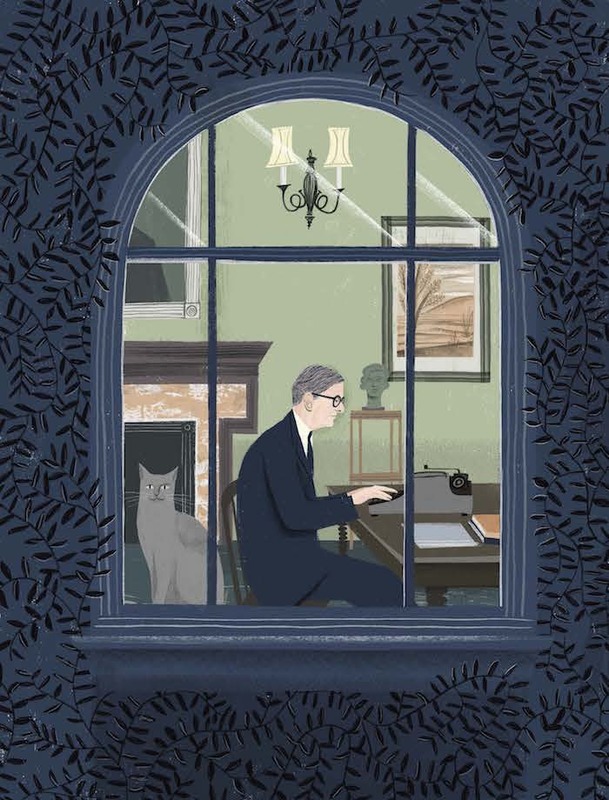 His writing is uncharacteristically vulnerable, and he credits cats with restoring his humanity. Burroughs was once asked by poet and fellow Beat Allen Ginsberg if he ever wanted to be loved. 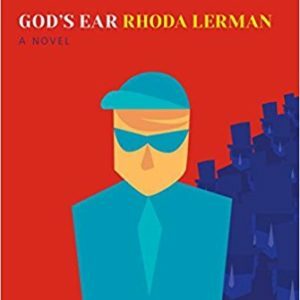 Raymond Chandler: Every great city deserves a great detective. For London in the late Victorian era, it was Sherlock Holmes. For the thoroughly modern city of Los Angeles in mid-twentieth-century America, it was Philip Marlowe. Marlowe, the hard-boiled gumshoe created by novelist Raymond Chandler, was a bourbon-drinking knight in a land of neon signs and smoky hotel bars. When Chandler arrived in Los Angeles in the 1920s, it was a new metropolis, a city without a past. This urban blank slate appealed to Chandler, who only began writing detective novels at the age of 44. Prior to this, he worked as an apricot picker, a tennis racket stringer, and an oil executive. A varied résumé, to say the least. T.S. Eliot: On a darkened stage, dancers cavort in leopard leotards. Wisps of face paint pucker and stretch as performers grin into a green spotlight. A tribe of dancer cats in unitards, the “Jellicles,” crowd the stage and decide which one of their number will ascend to heaven, to be reincarnated. This is Cats, the musical by Andrew Lloyd Webber, based on a book of “light verse” by poet T.S. Eliot. 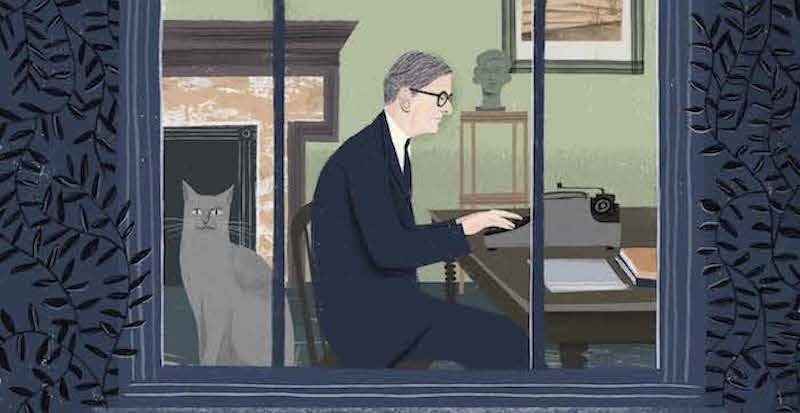 Thomas Stearns Eliot is one of modernist poetry’s beloved grandfathers. His epic poems The Waste Land and The Love Song of J. Alfred Prufrock are steep mountains in the landscape of modernism—required reading for many an English major. Although his writing was seen as overly obscure by some of his contemporaries, there are lighter moments in Eliot’s body of work. In particular, Eliot created a fanciful collection of poems about cats entitled Old Possum’s Book of Practical Cats. 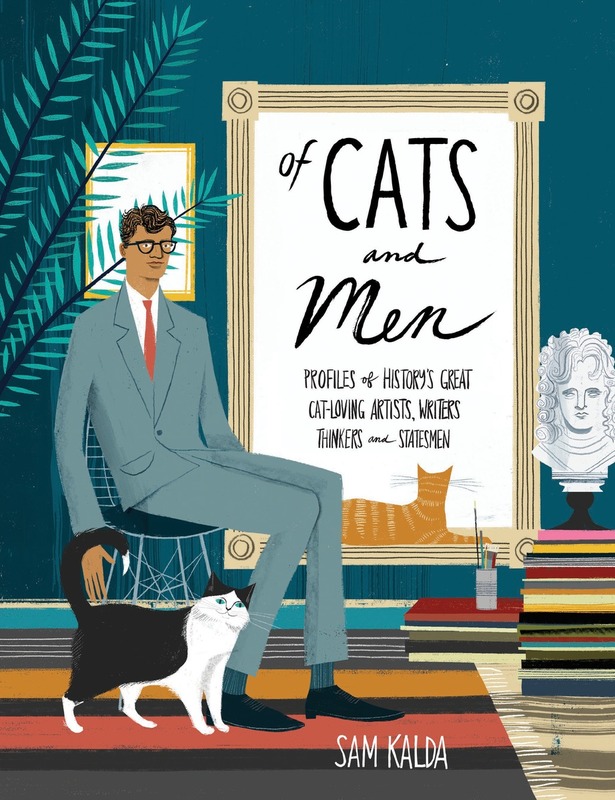 Originally written for his godchildren, these poems regale the reader with tales of eccentrically named cats: Mr. Mistoffelees, Skimbleshanks, Bustopher Jones, and Rum Tum Tugger, to name a few. In one long incantation of a poem, Eliot informs the reader about the proper way to name a cat. Originally published in 1939, the slim volume featured illustrations by Eliot himself. Later editions of this beloved book were illustrated by the likes of Edward Gorey. 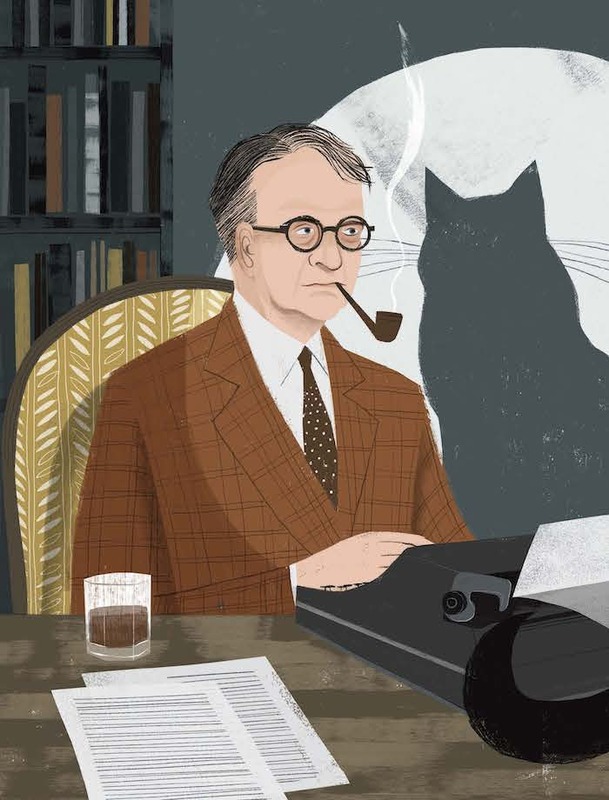 When writing about Eliot for a Cats theater program, his late wife revealed, “Whenever he was unwell or could not sleep, TSE would recite the verses under his breath.” Now one of the longest-running musicals in history, Cats remains a testament to the infectious whimsy of Eliot’s words and an enduring legacy of his feline muses. Michel de Montaigne: Throughout the last four hundred years, Michel de Montaigne has been regarded as one of the most influential writers of the French Renaissance. An aristocrat and statesman, Montaigne experienced a profound midlife crisis and began writing his much-famed essays. For all intents and purposes, Michel de Montaigne invented the essay—and not the dreaded essays born of procrastination we remember from our school days. Derived from the French word essai, meaning “to try,” “to attempt,” the essays Montaigne wrote were candid explorations into his own psyche. His digressive style left few subjects untouched, from marriage and horseback riding to kidney stones and the proper way to leave a dinner party. 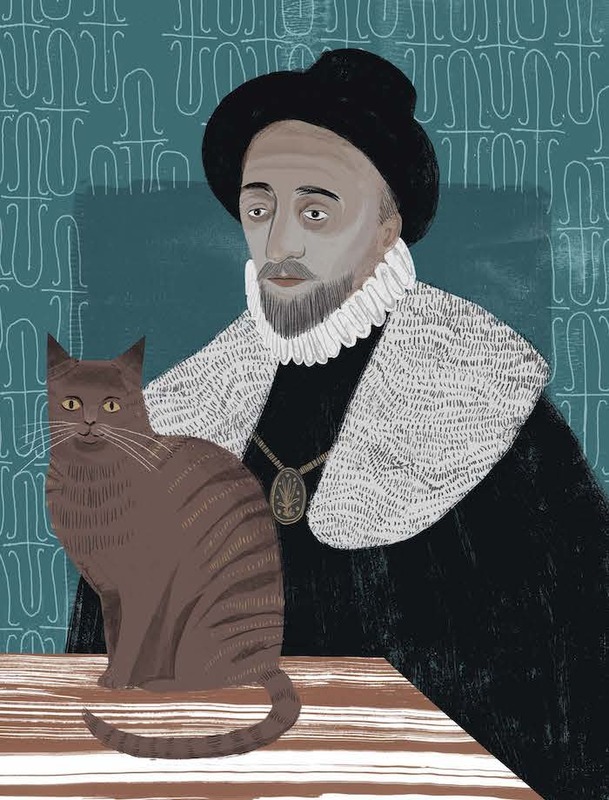 Given the breadth of subject matter he explored in his essays, it’s no surprise that there is a particularly regarded passage in “An Apology for Raymond Sebond” about Montaigne’s pet cat. In the essay, Montaigne writes critically of the vain tendency of humans to feel superior to animals. Wondering what the world might look like from her point of view, he writes, “When I play with my cat, how do I know she is not playing with me?” By imagining the world from the perspective of the other (another species, in this instance), he saw the world through the eyes of a thoroughly modern man—the first modern man, some might say. Cherished in the hundreds of years since their publication, Montaigne’s essays helped lay the foundation for the Enlightenment in Europe. To be sure, his words will make us mindful of our cat’s wide-eyed stare the next time we reach for a stuffed mouse.